Although it probably never occurs to the average person gazing up into a clear blue sky on a tranquil day, the atmosphere can be riven by enormous channels, hundreds of miles wide that are very similar to the rivers that course through the landscape. Even less likely are they to imagine that these so-called “atmospheric rivers” play a critical role in the global water cycle and are a key source of the moisture that falls as rain and snow in the Western states, ultimately providing fresh water through snowmelt in the dry season and during droughts to a huge swath of this semi-arid region. However, atmospheric rivers, like their terrestrial counterparts, also can cause flooding rains in coastal and inland mountains that can have devastating effects on people and landscapes, causing untold costs in property damage and even taking lives. One such river produced more than 40 inches of rainfall in the mountains of southern California in only four days in early January 2005. That, in turn, caused a massive mudslide in La Conchita, Calif., that took 10 lives and produced widespread flooding. Understanding how moisture-laden atmospheric rivers form and behave could help weather forecasters greatly improve their ability to predict when such floods might occur and aid theNOAA National Weather Service in issuing watches and warnings. As part of their mission to improve the ability to predict and track storms that emerge from their winter breeding grounds over the Pacific Ocean to batter the U.S. West Coast, scientists at the NOAA Environmental Technology Laboratory (now part of the NOAA Earth System Research Laboratory) in Boulder Colo., have learned a great deal about the atmospheric-river phenomenon and continue to focus on learning more about how these rivers affect both weather and climate. 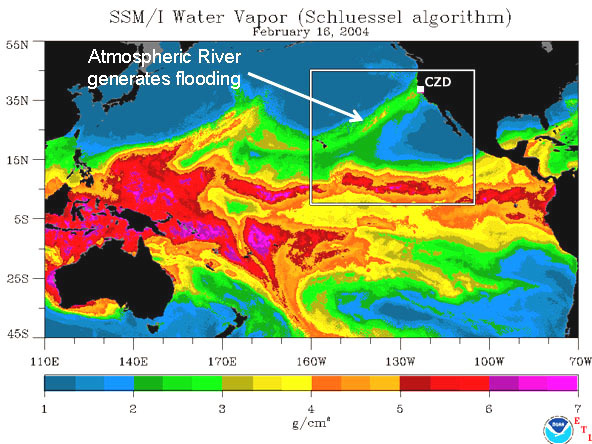 Atmospheric rivers are a key feature of nature’s atmospheric water supply pipeline. While scientists and forecasters have long recognized that the water vapor that fuels rain, snow, stream flow and storms is transported by a variety of atmospheric processes, it has only recently become apparent how much of this is focused in very narrow regions of the atmosphere—the so-called rivers—that move with the storms. Using a combination of computer simulations and atmospheric observations, NOAA ETL scientists have confirmed that more than 90 percent of the water vapor that is transported towards the poles in the heavily populated mid-latitudes are channeled into these rivers, narrow regions of very moist and fast moving air, roughly 240-480 kilometers (150-300 miles) wide, within the lowest 3,000 meters (10,000 feet) of the atmosphere. NOAA’s five-year strategic plan calls for the agency to increase the use and effectiveness of climate observations to improve long-range climate, weather and water predictions. He said, for example, that researchers are beginning to explore connections between the strength and frequency of atmospheric rivers that affect the U.S. West Coast and Pacific water-temperature distributions (such as the El Niño phenomenon). They also are looking into the relationship between West Coast atmospheric rivers and massive thunderstorm complexes over the western Pacific and the Indian Ocean. Many atmospheric rivers form in the mid-latitudes when cold fronts concentrate moisture into narrow ribbons as it is transported toward the poles. Occasionally, atmospheric rivers tap moisture directly from the tropics. “When you tap the tropics, you’re tapping into what I would consider a vast supply of moisture,” said Paul J. Neiman, a NOAA ETL researcher who is studying the atmospheric river phenomenon. In these situations, the likelihood of devastating rainfall and flooding—such as what occurred in La Conchita—increase significantly. Neiman hopes one day to understand what causes some atmospheric rivers to become conduits for enormous floods, while others are primarily important as elements of the planet’s system of heat and moisture regulation. Understanding the phenomenon, he notes, would be a first step toward being able to predict what a given atmospheric river will do. To better understand the atmospheric river phenomenon, Neiman and a team of NOAA ETL researchers teamed up with the NOAA Aircraft Operations Center in March and April to fly theP-3 Orion research aircraft from Honolulu into several atmospheric rivers. Two consecutive flights were carried out in late March through a developing atmospheric river that eventually extended from the tropics to the Pacific Northwest of the United States. The P-3 on its first flight successfully released 44 dropsondes—weather reconnaissance devices designed to be dropped at altitude—in two parallel curtains, roughly 600 kilometers (370 miles) apart, across a developing river north of Hawaii on the first flight. The second flight the following day released another high-resolution curtain of 23 dropsondes across the river in an effort to assess its evolution. The day after the second flight, the mature atmospheric river slammed into the Pacific Northwest, resulting in heavy rains that offered temporary relief, but also generated floods, in the drought-stricken region. The P-3 data gathered during the two flights will help further scientists’ understanding of interactions between the tropical and temperate air masses during the cooler months of the year in the Northern hemisphere and their role in generating significant floods and other phenomenon along the U.S. West Coast. A third P-3 flight on April 8-9, west of Hawaii, gathered data from 66 dropsondes from a region where conditions were favorable for a moisture-bearing atmospheric river to develop and directly tap moisture from the tropics. Ultimately, a well-defined atmospheric river did not develop. However, studying this event is expected to provide invaluable insights into the dynamics that are required to generate atmospheric rivers originating from the tropics and extending deep into the mid-latitudes. NOAA, an agency of the U.S. Department of Commerce, is dedicated to enhancing economic security and national safety through the prediction and research of weather and climate-related events and providing environmental stewardship of the nation’s coastal and marine resources. If you can get one in between all the chemtrailing days.